When it comes to customisation, snooker cues aren’t the things that obviously spring to mind. 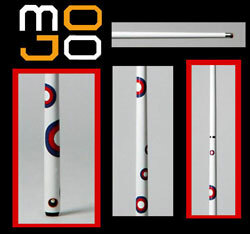 But MoJo are offering just that with the Mod-themed snooker and pool cue. What you get is a 2-piece carbon-fibre MoJo cue (apparently more durable than the old wood cues) with a soft case (or optional hard case) and titanium fittings for the join. And for "Mod-themed" read targets – not your usual targets, but a smart design all the same. The design is actually part of the construction, so no chipping or fading over time. New to the UK and limited edition, you can pick one up for £55 with a soft case or £60 for a hard case.